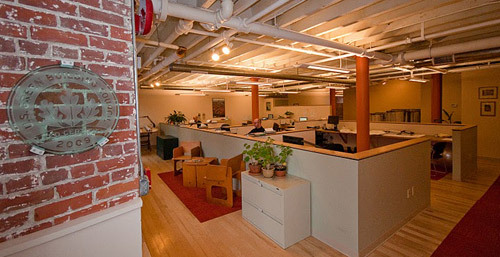 The office space at 110 Main Street in downtown Burlington, Vermont was designed by Cx Associates and the Brick Box Company to achieve LEED Commercial Interiors certification for energy efficiency, building commissioning, proximity to public transportation, lighting, water and material use. The office’s flooring is locally-sourced Vermont maple, and the cabinetry was salvaged from another construction project. There is on-site secure bicycle storage to encourage a car-free commute, and the office has on-site recycling and composting in place. The office lighting system uses 60% less energy than is allowed by code. Carpeting is NSF 140 Gold certified, meeting requirements for public health and environment, recycled content, and energy efficiency in the production process. When the carpet wears out, the manufacturer will take it back and reuse the components. The office has been awarded LEED Certification by the U.S. Green Building Council (USGBC).